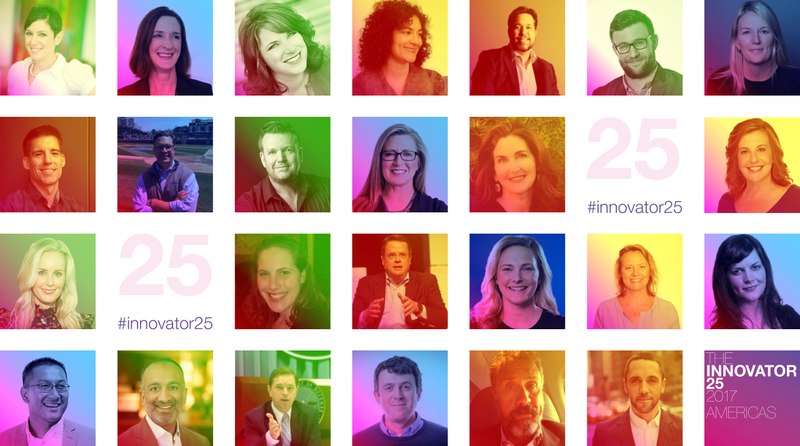 Our fifth annual Innovator 25 Americas includes the United States, Latin America and Canada. This year's innovators made the cut because they're producing work that points to the future of marketing and communications. 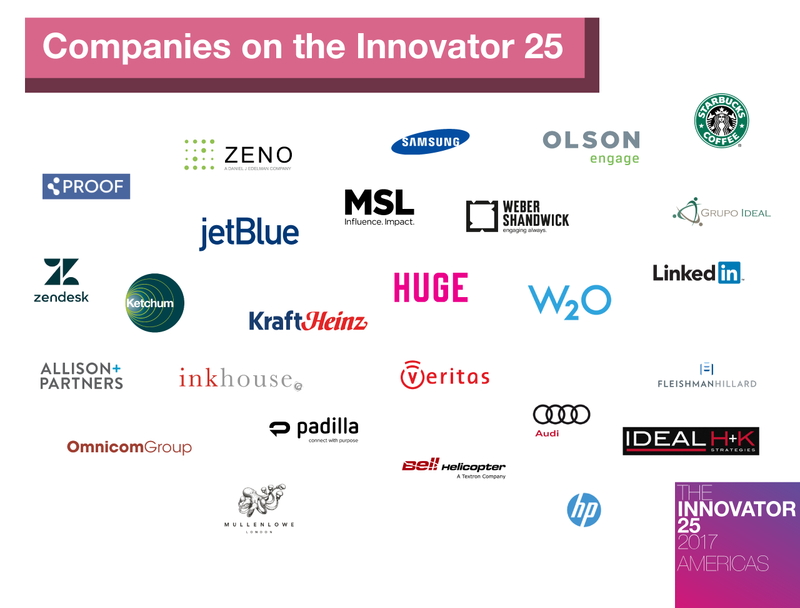 Innovation is evolving and this list reflects the diversity inherent in curating a list like this one. Champions for creativity, pay equity, storytelling and business analytics are among those featured on the list, all innovators in different — but meaningful — ways. For the first time, two innovators make their second appearance because they have expanded and built upon the reasons they were originally on the list. 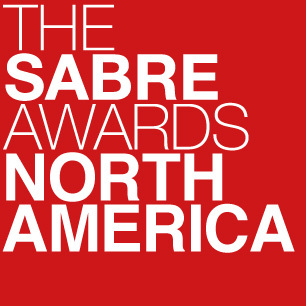 This year's class comes from a range of organizations— holding group firms, specialist boutiques, blue chips, emerging darlings, among others. 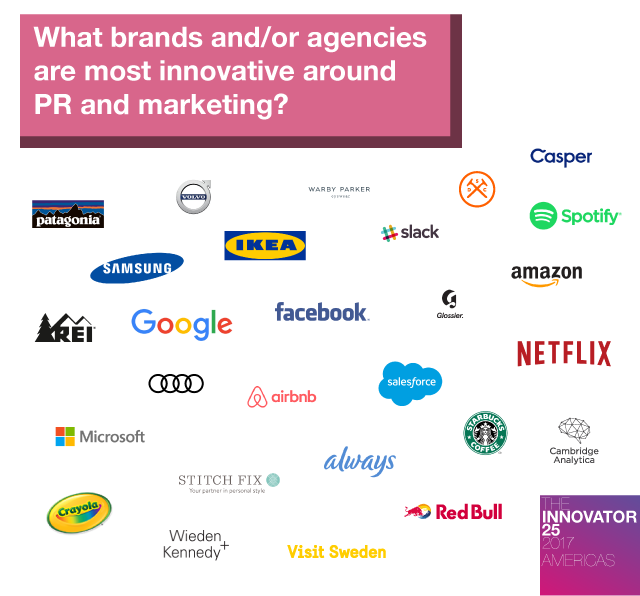 Many of those on the list were involved in some of the most celebrated and innovative work that pushes the boundaries of influence and engagement. 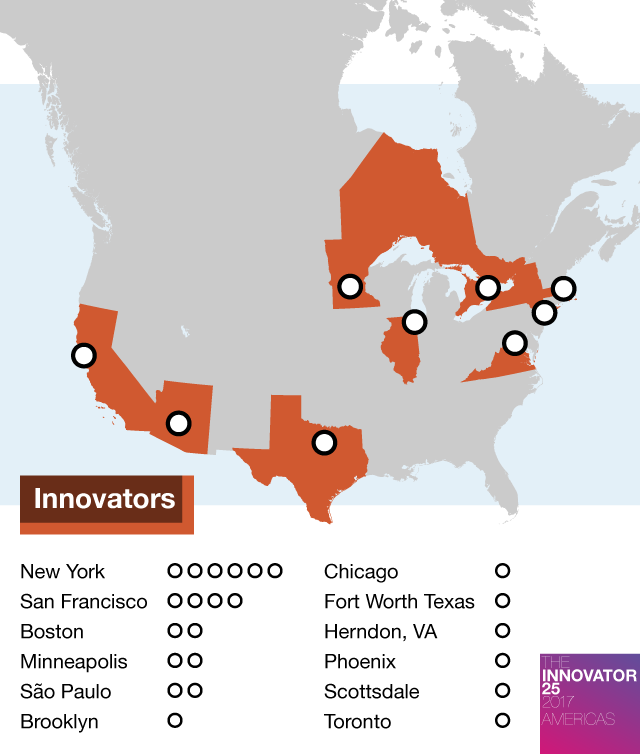 Like most years, many on the list are clustered on the coasts — mostly New York and San Francisco — but, as always, the list shines the light on other innovation hotspots that don't get as much recognition. 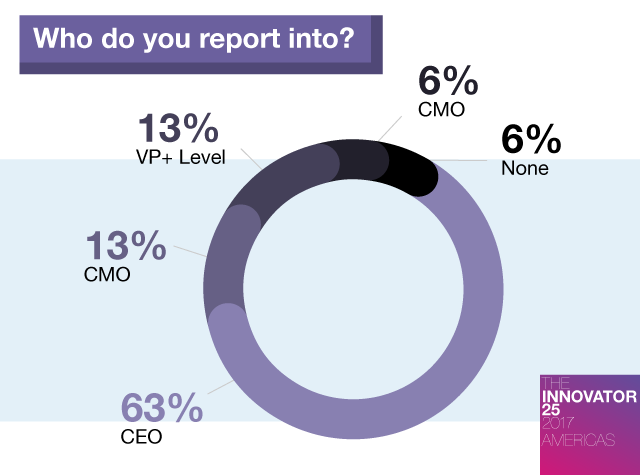 More than 70% of the Innovators have been part of their industry for more than a decade and more than 60% report directly into their CEOs. Those who selected 'other' report into the chief data/analytics officer, board of directors, president or senior partners (or no one). 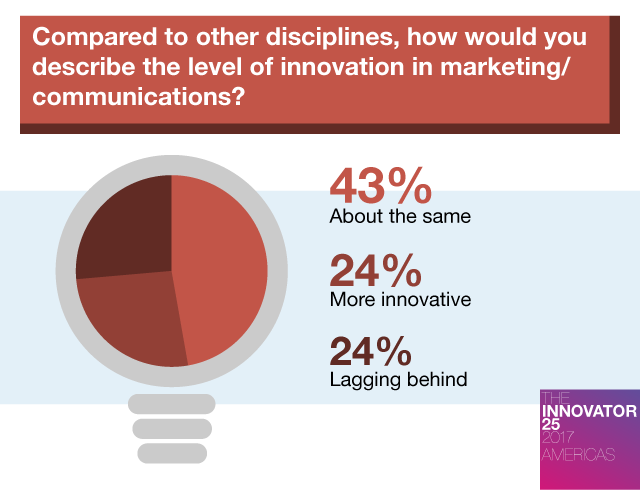 Interestingly, while the innovators have established careers, most are relatively new to their current positions. Fifty-seven percent have been in their jobs for three years or less and only 13% have been in the same position for between 8 to 12 years. For the first time this year, none of the Innovators have been in their roles for more than 12 years. 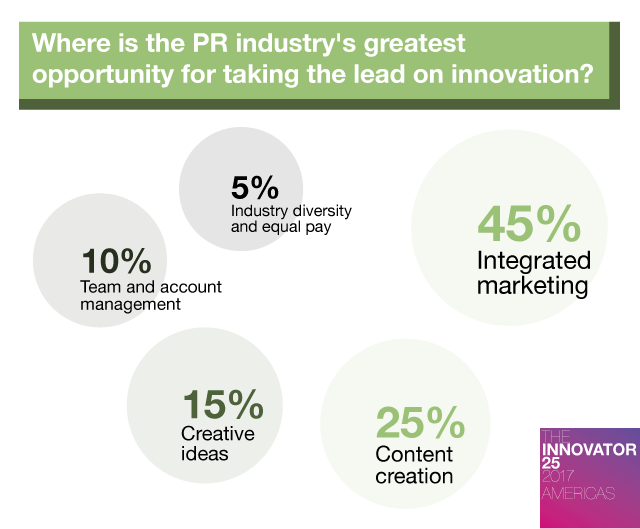 Forty-five percent of the Innovators say the PR industry's greatest opportunity for innovation comes from integrated marketing. "I believe the convergence of marketing, PR, government affairs into a single discipline which I call strategic communications, represents an opportunity for PR to really step up and demonstrate our ability to innovate and lead," says Bell Helicopter CCO Robert Hastings. Meanwhile, Veritas CEO/president Krista Webster says "PR has shown tremendous adaptability in the communications mix, and has taken the lead on redefining what that mix actually is and how it provides value." 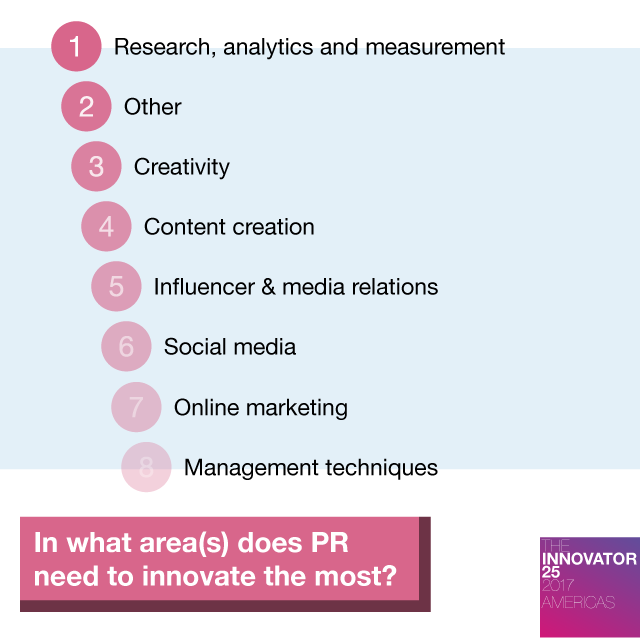 When it comes to the areas that PR needs to innovate most a murkier picture emerges. While research, analytics and measurement comes out on top — close runners up were creativity and content creation. Nearly 40% of respondents also cited 'Other' with responses that include Veritas' Webster pointing out that "PR can’t stay in a specific lane, it needs to push the boundaries across the board." Zendesk VP of communications Dushka Zapata says "PR needs to redefine itself and how it develops content people would be interested in reading." W2O Group's Seth Duncan makes a case for all of the above. "PR needs to take a more nuanced approach to understanding target audiences and relaying the right messages in the channels that those audiences live in," he says. 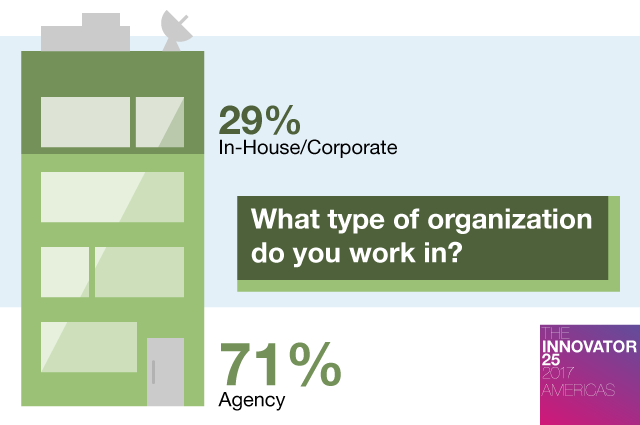 "One-size-fits-all messaging, events, and media relations is a thing of the past."